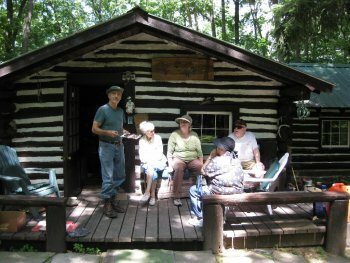 Caption: On July 27th this writer, his wife and two friends experienced the pleasure of visiting the legendary Webbers at their cabin home high above Slate Run on the west side of Pine Creek. From the left are Bob and Dottie Webber; my wife, Beth Kagan; and Jersey Shore residents Janice and Dave Lovell. The Webbers have lived for over 40 years in their vista-blessed aerie, existing harmoniously with nature, without the modern conveniences of electricity, running water or telephone service. Bob is a retired forester and the person mainly responsible for the creation of hiking and skiing trails in the mountains surrounding his home, including the popular Golden Eagle and Black Forest trails.